Overlapping performances by Mac DeMarco and St. Vincent did little to stop fans of Violent Femmes from coming out in droves to witness their first Ottawa appearance in 16 years. Walking onto the stage wearing rather unflattering khaki capris, reading glasses and a short-cropped dad hairdo, vocalist Gordon Gano fumbled through the opening numbers, "Blister in the Sun" and "Kiss Off," that — coupled with the fact that original drummer Victor DeLorenzo was no longer touring with the band — threatened to send the show into dubious territory. But once Brian Ritchie locked into his emblematic acoustic bass line for "Please Do Not Go," the four musicians on stage (now including percussionists Brian Viglione of the Dresden Dolls on stand-up drums and John Sparrow on cajón) began to gel with each other and the just-happy-to-be-there audience. Playing their renowned self-titled album from front to back, the Femmes began to gain considerable steam, culminating with a wild rendition of "Confessions" that brought out auxiliary stage performers Darren Brown on pocket trumpet and Blaise Garza on sax. 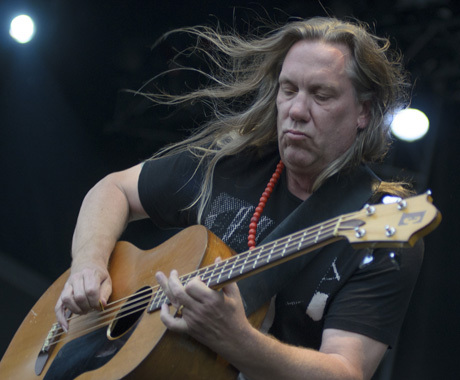 Wrapping the 40-minute performance of their debut, Violent Femmes rolled in to a greatest hits set that focused heavily on their "other" masterpiece, Hallowed Ground, including a raucous rendition of "Black Girls" that featured an absolute show-stopping drum solo from Viglione. Closing with a sing-along version of "American Music," Violent Femmes delivered one of the beloved performances of the festival, thanks to Gano and Ritchie's Milwaukee charm and an exceedingly talented support staff.